Episode #6 - Guests include Co-Founders, Dominic Cochran and Jason Gabriel, for the Capital City Film Festival! Episode #5 - Guests include Jen Sygit, Jeff Bone, Justin Muschong and William C. McCallumfrom the award-winning Fairview St., which is celebrating it's 10th Anniversary. Episode #4 - Guests are award-winning filmmaker, actor, editor Scott Baisden and his wife, talented make-up/sfx artist ANNE. Episode #3 - Guests include GRFF 36 Hour Film Challenge Teams. Episode #2 - Guest is award-winning documentary filmmaker, Rudy Valdez. Episode #1 - ​Guest is award-winning Producer/Actor, William C. McCallum. GREAT NEWS! 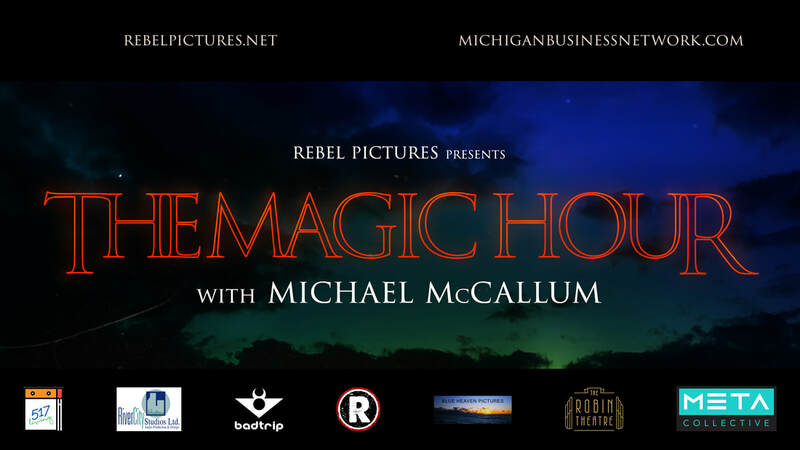 I'm beyond proud to share my NEW solo radio show, The Magic Hour with Michael McCallum! This show is brought to you through the Michigan Business Network, like Show Biz Weekly with Taylor Kelsaw was. I had a wonderful 2 1/2 years as official co-host for SBW and hope to be a part of it again. Taylor Kelsaw gave me a great opportunity and I'm forever thankful for that. When he moved to Arizona this past summer, Jeffrey C. Mosher reached out to me and asked if I'd like to start my own show. It's taken some time with schedules and getting things in place, but I couldn't be more excited and honored to do this. The Magic Hour with Michael McCallum is a film/photography reference, "the period of daytime shortly after sunrise or before sunset, during which daylight is redder and softer than when the Sun is higher in the sky." This show will cover Movies, Arts, Government, Independents and Community! Our first episode is up on SoundCloud and can be listened to NOW! My Father/rock/best friend, William C. McCallum, is my first guest. Check it out, share and support this NEW positive endeavor. *Logo designed by Scott Baisden and Michael McCallum.